We’re excited to be participating in Jennifer Rizzo’s Holiday Housewalk link party! Hello and welcome to our Christmas Home Tour! We are thrilled you’re joining us today and we hope you leave inspired to add a little bit of holiday joy to your own homes this season. 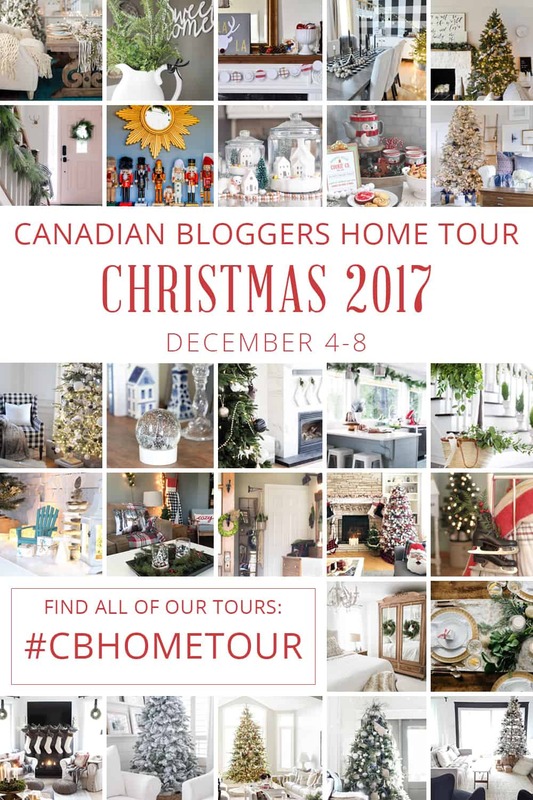 And we’re just as thrilled to be taking part in The Canadian Blogger’s Christmas Tour 2017, hosted by our friends, Shannon of AKA Design and Christina of The DIY Mommy. As a Canadian blogger, it is so fun to join forces with our fellow Canadians, and as usual, I am so inspired by all of the talent and creativity in this group. I hope you enjoy this tour as I take you from room to room in our holiday home and share how we will be celebrating the season this year. And please be sure to check out all of the beautiful homes dressed for Christmas at the end of today’s post. I’ll start by sharing a little peek into our kitchen. If you’re familiar with our blog, you may have already seen our holiday kitchen as I shared it here. But as the season has moved forward we’ve added a few new touches to keep it feeling festive and fresh. For starters, I shifted our hot chocolate station from the corner to the wall closest to our coffee maker. During the Christmas season, I like to start my mornings with a cup of coffee and a little sprinkle of hot chocolate so this just makes it a bit more convenient. 🙂 Plus, I love having all of the fixings for hot chocolate at the ready, it’s our favorite cold weather drink. There is just something magical about sipping a mug of hot chocolate (overflowing with marshmallows, of course), snuggled in your cozy home while watching the snow swirl and blow outside. Sweet little gingerbread houses take center stage, sprinkled with powdered sugar and adorned with sprigs of eucalyptus and juniper. It’s a simple snowy scene that the whole family can take part in making. I didn’t change anything in our open shelving, I kept this space simple and fresh with boughs of faux pine branches, a few rose gold Christmas balls scattered about and tiny snow-covered villages under glass cloches. I also hung a strand of faux garland along this beautiful sign that hangs in our kitchen. But I think my favorite addition is this sweet floral arrangement. I always love incorporating fresh flowers into our home, no matter the season. It’s an easy way to add a little touch of happiness, don’t you think? I originally had this arrangement in our living room but thought it didn’t feel “Christmasy” enough, but in our kitchen, it’s a welcome pop of color. I used these adorable mini decorative cabbages, dainty wax flowers, eucalyptus and blue thistle all nestled in a simple utensil holder. Now, into our dining room, you’ll see our beautiful handmade table set for a holiday feast! We absolutely love entertaining and the Christmas season is the perfect time for hosting family and friends in your home. Gathering around the table to share laughter, hopes, and memories from the past year is one of our most cherished holiday moments. And don’t be fooled, a pretty table doesn’t have to be timely or expensive to set, a few pieces of greenery and your everyday dishes is all you need. I won’t go into detail on our table because I shared all about it yesterday (you can catch up here), along with 9 other beautifully festive Christmas tablescapes from a few very talented friends. I added a few simple holiday touches to our hutch, like a wooden JOY sign and white and silver Christmas balls. While silver and rose gold glass Christmas trees line our farmhouse style sideboard. And extra pillows line our DIY window bench for a cozy place to sit and watch the world turn into a winter wonderland (with a mug of hot chocolate, of course!). From our dining room, you have a clear view of our living room which features our gorgeous new snowy flocked tree. If you read about our new tree (here), you’ll know I’ve been dreaming of owning a flocked tree for a few years now and was over the moon to finally add one to our holiday decor this year. I dressed it in silvers, whites, rose golds and a few deep indigo Christmas ornaments. But my favorite has to be that vintage-inspired gold star on top. A simple arrangement of fluffy white hydrangeas sits atop our DIY coffee table, along with these sweet vintage brass deer figurines I picked up a thrift store earlier this fall. I think they add just a touch of whimsy. Our layered gallery wall also got a little update. I added two new abstract prints and I am in love with the pop of color they add, I just feel like the photos really stand out against all of the white. And speaking of pops of color, I have to touch on these gorgeous pillows again. Many of the pillows you’ve seen on our holiday tour came from this incredible shop, and all are made from vintage material sourced from all over the world. I truly cannot get enough of these designs and want to fill every corner of our home with them. Now before we head up to our bedroom, you’ll see we hung a faux flocked garland along the banister of our stairs and because we don’t have a fireplace in our living room, I usually choose to hang our stockings here as well so they are ready for Santa to fill on Christmas Eve. Just like the rest of our home, I kept our bedroom very simple with a natural feel. An unadorned tree sits in the corner, twinkling in the evening dusk, along with a simple faux garland on our headboard. It’s these little touches that were so simple but add a big dose of holiday spirit. Our mantel is dressed in more greenery and lined with pillar candles perched on top of chunky silver candle holders. You might also notice a little change to our bedside tables. On a whim, Nick decided to refinish our existing pieces because we’ve always felt they were too heavy (they used to be black) for our bedroom. He simply sanded and stained them and now they add a perfect touch of warmth to our bedroom. Love the greenery you used on your table and your tree is absolutely beautiful! Thanks so much for the tour! What a beautiful home tour Alicia! I LOVE the pops of navy throughout your home…it’s perfect! Thank you, Joanna, I love not straying too far from our home’s color palette during the holidays. Merry Christmas! Beautiful home! I love the Christmas touches in your bedroom too! And I love the navy. We incorporated navy into our decor this year too and I’ve LOVED it! Happy holidays! Alicia your home looks so beautiful and cozy for Christmas. Love the colours and how calm and magical it all looks! Alicia! Everything is soooo gorgeous! Well done my friend. Your home is perfection. I love you you keep the blue through out even at the Holidays. Everything is stunning! But that little desk scene hs my heart 💗 Happy holidays! Wow, Alicia, it’s all so very pretty. Your colour palette totally speaks my language, as well as the understated simplicity. Lovely! What a fresh and welcoming home you have! I love the blue tones and vintage touches scattered about. Very pretty. Your home is so so stunning and your Christmas decor is just out of this world! I absolutely love it Alicia. The pops of blue are so gorgeous with all the white and warm neutrals! I thought about doing blue this year but gravitated back to reds… might just have to change it up for next year now that I’ve take in your stunning tour. Awesome photography skills and staging!! Merry Christmas! Thank you so much Krista! 🙂 Every year I think I want to do red, but I have such a hard time incorporating it into our home, but I sure do love how festive it is! I love how the blues and whites blend together with the festive greenery – amazing! Thank you, Denise, Happy Holidays!